The ultimate humidifer for cigar cabinets. MCT L is designed to ensure uniform air humidity in 2m high cabinets without any additional device, water tank or fan. 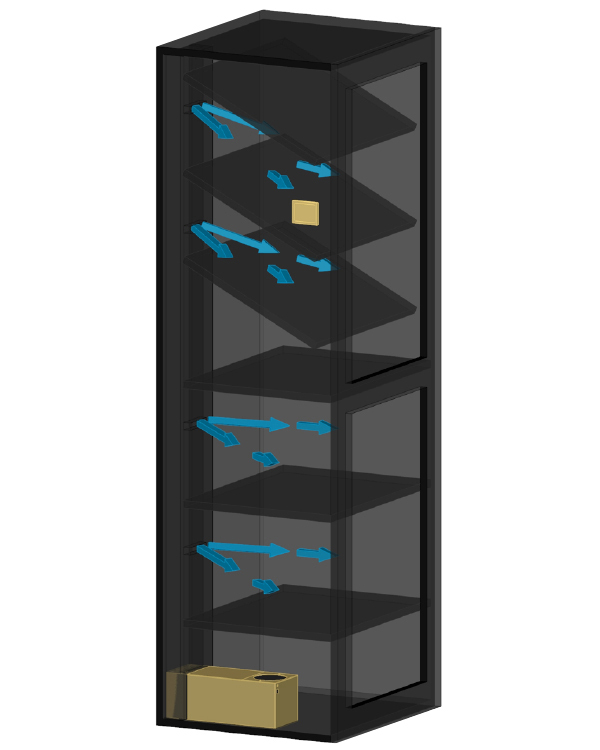 At a 2m vertical height difference both gravity and temperature has effect on humidity dispersion, but MCT L was engineered to handle every physical impacts. The 3 layers of acriliy gel pack stores 2l of water, and lasts for 5-6 month until refill. You mount conveniently the elegant controller magnetically to your eyes height, and so it also measures humidity physically at a right place. In MCT L, three layers of gel packs lying on positioning grids – 3 cylinders each – are responsible for the increased humidification performance. MCT L has 6 times bigger humidification surface than a usual, tank-type device filled with the same amount of gel. Each MCT has air outlet holes both on its top and the bottom which you can block with the supplied accessory plugs, depending on which direction you want the humidified air to be blown. Out of the 7 wholes MCT L has, 4 should be used. MCT was created to work properly without any additional fans, water tanks, etc. 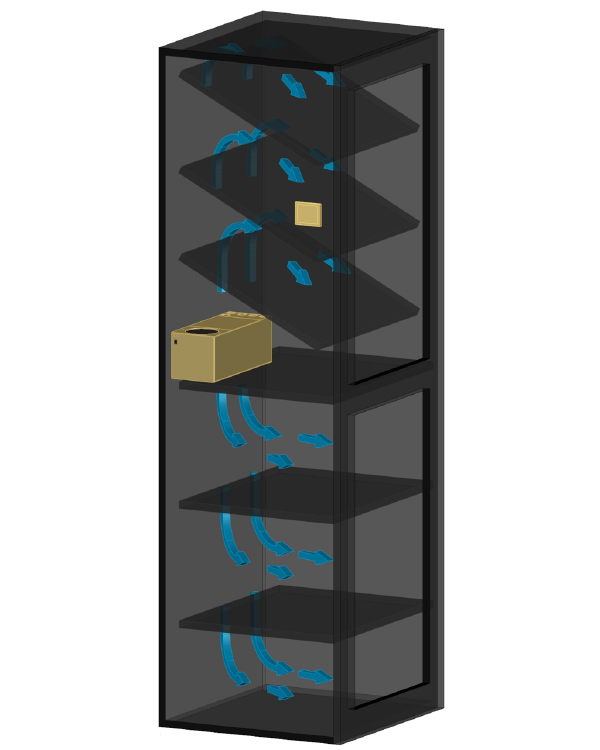 The unique MCT feature is that if you place it vertically in the middle and push it to the back wall of a cabinet, you can have the air blown up and down ensuring a real uniform humidity! No second water tank, no additional fan, wires are needed. To get the best result we recommend two ways to use MCT L in a humidor cabinet. Place MCT L in the middle, to the backwall, plug the upper right 3 holes letting the air blown out from the left top and bottom 2-2 holes. To work as precise as possible MCT L is designed to blow a certain amount more air upwards to equalise gravitational effects. Using an air duct has its benefits. Always ask your humidor cabinet manufacturer, whether they have the know-how to use an air duct. 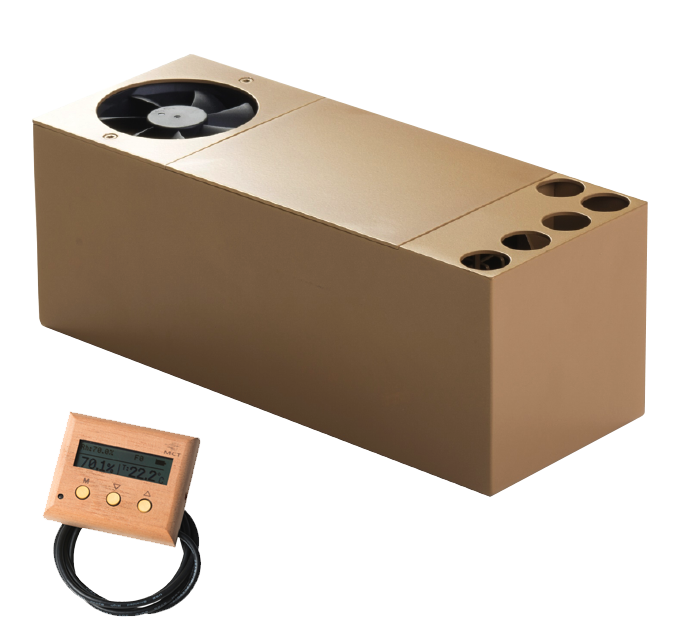 Maklary Humidors uses all MCT models with specially constructed air ducts.